Custom awnings are an important investment. Our sales reps have great awning ideas. he nature of a custom designed, non-returnable awning is an important investment. An on-site visit, before placing an order, is vital to the success of your project. We do not want to over-sell or under-sell our customers. It is our goal to provide you with a top quality product that will make you happy for years to come. Contact us for your personal consultation today. What Can You Expect From Chesapeake Awnings.com? Chesapeake Awnings.com offers cleaning and winterizing contracts during the months of October thru December. Due to the seasonal aspect of our awnings business, we limit our contract services to this time frame in order to give you our best attention. Yearly maintenance and cleanings prolong the life of your investment. Waiting too long to address your cleaning needs may impact the desired look of your custom awnings. All projects are based upon the number of awnings, accessibility, and cleaning challenges. ​Contact us to book your free estimate or appointment today. Protect Your Awning Investment With a Smartcase! Chesapeake Awnings.com prides itself on customer service. We make all attempts to make a service call within 48 hours after notification. We service most models of awnings and attempt to assist you with repairs, replacement parts, motors, or fabric as needed. We work with insurance companies when the forces of mother nature take place. Emailing pictures of damages to chesapeakeawnings@yahoo.com assists greatly with the processing of a claim. 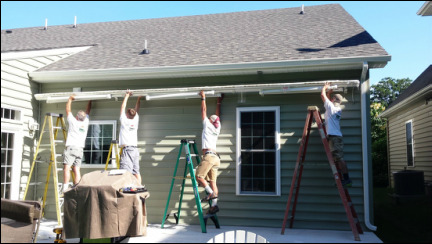 On-site visits are the best way to make sure your awnings is restsored to its original condition. Fabric by the Yard Available for cushions and accessories to Match your Awning. Sunesta offers over 150 fabric selections, including water resistant, waterproof, and UVA sun protectant products. Review Sunesta's recent endorsement with the Skin Cancer Foundation at sunesta.com. ​We can replace old fabric to restore your awning to like-new conditions. 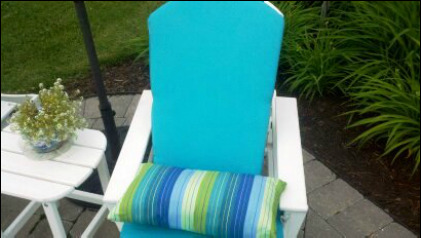 Fabric by the yard is also available for matching cushions and pillows on you deck furniture. Contact us for fabricator pricing. Download a picture of your home and make a list of your fabric selections. Email this information to: chesapeakeawnings@yahoo.com and we will email you design concepts of that awning on your home. We've Got You Covered! Visit us Soon!